Rank tracking is the monitoring of the keyword positions that pages of your website appear for in a search engine query result. Keyword tracking is done on a frequent basis (usually daily) so that a line graph can be constructed which shows over time if the ranking positions are changing over time. Keyword rank tracking is extremely important for proper SEO analysis as it will indicate to us if optimization tasks have helped a page or site rank higher. Keyword tracking is usually setup to keep track of the organic Google listings of where a specific page falls when a search is performed. A specific page on a dental website was ranking at about the 15th position for the keyword phrase “teeth whitening” in Google (organic results). Each day the position was checked with keyword rank tracking software. As you can see in the image, the position increased over time, so that after three months of optimization work (both on the specific page and the site overall), the page is now ranking at position number three. You can also notice that the graph line is fairly smooth although there are a few jumpy dates as the position bounces around from day to day. That is one of the reasons why rank tracking over time is important, so that we can a get a better idea if there is general improvement or not. In this case, the graph us shows a very clear point where a drastic improvement has taken place. This is awesome to see because it makes it very easy to identify what optimization work has resulted in this ranking improvement. We can then use that information to optimize other pages in a similar manner. You will notice that there is a period of time where the ranking positions fluctuated between its old and new positions. We call this the Google Dance. Google runs various search engine algorithms that give slightly different ranking results. Eventually however, if optimization is properly done, the new improved position will stick. Local rank tracking is different than general rank tracking because we are simulating the search as if done from a specific location. Google is pretty good at figuring out when a searcher is looking for general information or when a searcher is looking for a nearby place. It will deliver different results for example if someone in Toronto searches for ‘best dentist’ as apposed to someone searching for the same phrase in Denver. 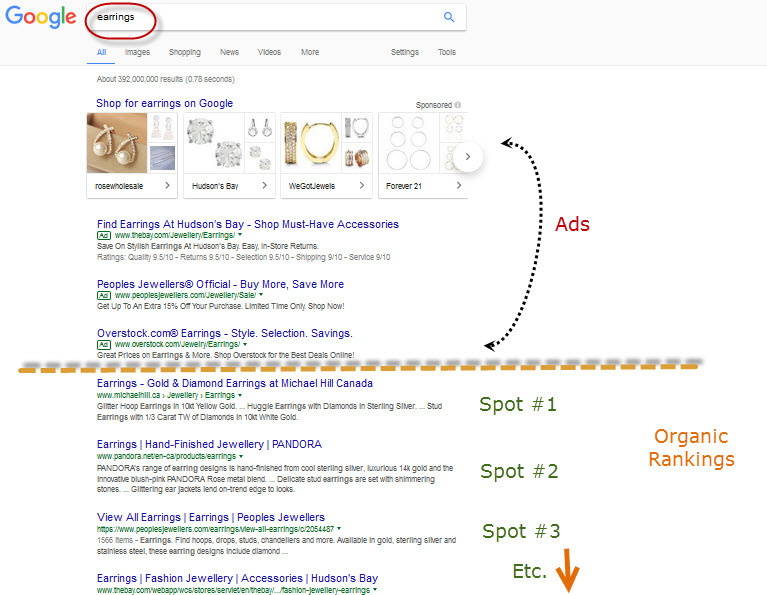 Google often delivers different results for the same keyword phrase depending on where you are. That’s why local SEO rank tracking is especially important for small businesses that serve customers from with a specific geographic area. Imagine a plumbing business that is mobile and can service two different but nearby towns or suburbs. A local daily rank tracking setup for them might include a search for the same exact keyword phrase for those two towns to see if the plumber is ranking better in one place compared to another. They might be ranking #1 for ‘plumber’ in town A, but only ranking #12 for ‘plumber’ in town B. We can then use that information to know what site optimization goals we should target so that the plumber can get more customers from Town B (without hurting the results for Town A). Using the best keywords that we have found through a keyword analysis, i.e. the ones that have the highest potential of delivering the most traffic to the site, we input these keyword phrases into the tracking software to get an idea of which pages of the site are ranking at what position. Using the information gathered from local or city rank tracking tool setup, we can then get an idea about which marketing targets and goals to focus on first. There are many different variations of tracking software, but all essentially do the same thing; plot a graph of ranking positions for selected keywords. A local rank tracking software will have the option to simulate a search coming from a specific town or zip (postal) code. Most local SEO consultants or agencies use online ranking tracking software such as SEMRush to track results and perform other professional SEO related tasks. These kind of services however have a price that an agency can cost average out over their many clients, but might be cost prohibitive for a single small business to absorb. An SEO professional will not only start daily recording of local keyword ranks, but will also have the knowledge of what to do with this information. As you can imagine over time, hundreds of keywords can be tracked. When you look at months worth of data, it might not be that easy for someone unaccustomed to sort through and filter out what this data is telling you and then be able to prioritize optimization tasks. Feel free to contact me so that I can take a look at some local keyword rankings for you to see what improvements can be made to your website. Even if you are comfortable making optimization changes to your site yourself, it can be really advantageous to have a local SEO consultant like me to give you a better idea of where your website is falling for various keyword searches.